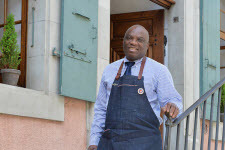 Born in Côte d’Ivoire, he is one of the finest connoisseurs of the Swiss wines. 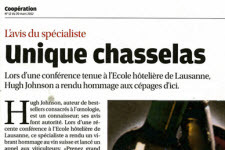 At a conference to l’école hôtelière de Lausanne, Hugh Johnson – the recognized author of bestsellers of oenology – paid tribute in the Swiss wines and issued an appeal for the wine-growers. Take great care of the chasselas and cultivate your local, unique and recognizable vines between all. Do not be trendy, there is already on the market enough sauvignon white or chardonnay characterless. Think well before to blend the pinot noir. Thus leave with these magnificent vines their own flavour. 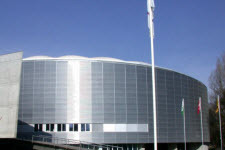 Aigle was selected to welcome the Concours mondial du vin de Bruxelles next year. Some 350 tasters will come to Chablais to taste between 9000 and 10000 wines.